Since Valentine’s is all about sharing love, we thought we’d share some love with a bonus game/skit called, Just Say It. As mentioned before this is more of a skit than a game, but if you select the right people, you can have a blast with it! Once you’ve selected your three participants (make sure to read Bonus Tips), have them come forward and set up a scenario for them to act out. 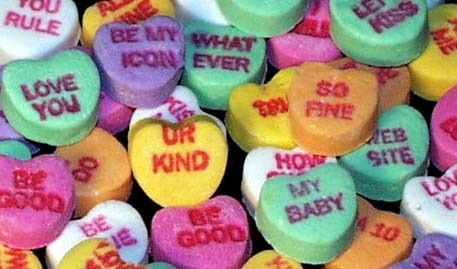 Here’s where the twist comes in, the participants will all have candy hearts (the chalk looking kind) in their pockets. When the moderator (probably you) says “Just Say It”, their next words must be read off of whatever heart they pull out. Let them know that while they must say what is on the heart, they can change their tone. Saying “Give me a kiss” with a glee is different than saying it with sarcasm. Inflection and tone are key in making this game work, so make sure you pick expressive people. While not everything they read will be hilarious, groups are bound to run into some humorous situations along the way! NOTE: Make sure that they know they are to keep it G rated, otherwise things can get out of hand. If you have leaders doing the game, you can probably get away with a bit more. 1. Choose three people who can improvise and speak loud. You can even have leaders do the skit if you are worried about having students do it. One unwilling participant in this game will kill it! 2. At certain points in the game, keep make them read the hearts several times in a row. Also encourage the participants to ask plenty of questions- this let’s the plot develop a bit. 3. If you know who you’re choosing, have them do a dry run through the skit. You don’t want it pre-planned, but you also don’t want them stumbling all over themselves. 4. Use people who are familiar with drama. There’s a good chance that they’ve done these things in their classes before. 5. Make sure your participants are facing the audience, just like they would in a play. 6. If you don’t want to interrupt by saying the words, “Just Say It”, have a sound effect to let them know when they need to read a heart.